This was the view from my back door a week ago. I'm not sure what the final totals were but it was a lot of snow. Unlike last year, there was a warm up a couple of days after the storm and most of the snow is now gone. My friend Jan, who lives in the country stayed with us to avoid getting stranded. She is the Cat Whisperer. She spent time photographing George. This may be my favorite. He is a very tolerant cat. Petipa would put up with this for a minute. Our very intrepid mail carrier made it through the storm to deliver several lessons. Reviewing them helped keep me busy. Again, as a reminder, please send me the tracking number for your packages so I can watch for them. This is a continuation from the topic last week. The knitter who originally contacted me sent me another email. One of the things she wanted to know was the math for using the various options for circular knitting. I am a math idiot but this is the kind of math I can do. If you have four DPN needles, divide the total number of stitches by 3. If you have five DPNs, divide by 4. If you are using two circulars, divide by 2. 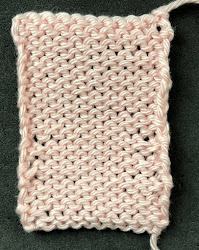 I think the main reason for the question was about dividing stitches when using the Magic Loop technique. I don't think it matters much. In fact, I think you are better off by changing it up every few rounds. If you keep the needles in the same position, you might get ladders between the column of stitches. You will meet knitters who will try and tell you that there is only one way to do circular knitting. Ignore them. Needle choice is personal. I do not enjoy the Magic Loop. It drives me crazy sliding the stitches around so much. I use DPNs or smaller circular needles. Is that the "right" way. Absolutely not! It is just what I like. The videos (there are two) show DPNs, two circulars, and the Magic Loop. Circular Needle Math Part 1 and Circular Needle Math Part 2. There won't be salon this weekend as I am going out of town. I will have salon on February 7th at 1:30-3:20. I finally finished the dress. I haven't written the pattern yet so it isn't completely finished...yarn tails, etc. Now I am working on the lacy overdress. It is the same yarn as the dress, just one strand and size 8 needles. It is a top-down, raglan construction.